Let's see what a golf chipping net can bring to you! Directly save your time and energy,you don't need to drive a long way to specific range,just training at home or even your office. 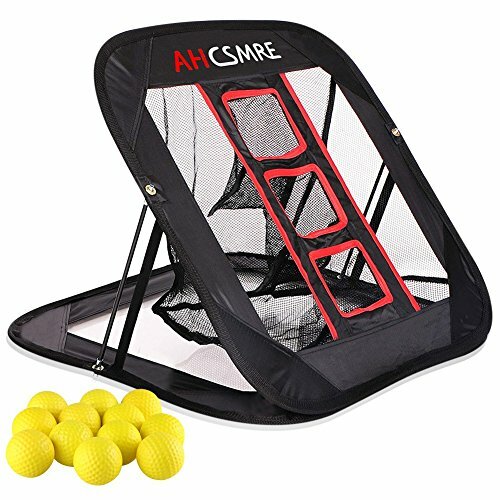 The secret to be a golf guru - sharpen your chipping skills, improve pitching accuracy with this 3 targets net shot after shot.perfect equipment for golf beginners. Anytime & Anywhere - equip with a portable light weight handbag,total weight less than 1lb,You can play golf whenever and wherever you want, indoor/outdoor day∋ght without weather limitation. Includes 12 Soft dimpled foam practice balls, yellow color for high visibility, suitable for indoor and outdoor use. Enjoy youself - set up a game with different target pockets with your families, friends or colleagues, making your practice more interesting than just hitting shots. Perfect gift choice for golf lovers. 100% Satisfaction Guarantee - if you are not satisfied with our product,we offer free exchange/refund within 45 days after purchase with no reason, buy now without any concerns!